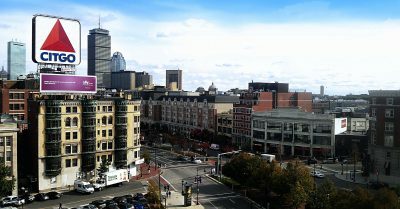 The cityscape of Kenmore Square is changing, with Boston University’s Barnes and Noble bookstore relocating and other businesses having to close shop as real estate firm Related Beal redevelops the area. Now, more changes to the square could be coming. Plans to build a new hotel and plaza at the western edge of Kenmore Square were unveiled by property developer Robert Korff at a community meeting Tuesday night. The proposed hotel would tower nearly 300 feet above the site currently occupied by a Citizens Bank, at the junction of Commonwealth Avenue and Beacon Street. The proposal would also slice a new street behind the hotel, connecting Commonwealth Avenue and Beacon Street in an effort to alleviate some of the area’s traffic congestion. Korff, the CEO of Mark Development and owner of the Citizens Bank building, proposed similar plans two years ago that garnered criticism from residents and city officials, according to the Boston Globe. Residents close to the proposed building site were concerned that the new building would overwhelm their own, and city officials said the plans would not do enough to improve conditions for walkers and cyclists in the square, the Globe reported. The new plans will address these concerns, according to Jeff Speck, an urban planner hired by Korff to design the project. Speck said the street proposed to run behind the new hotel would create additional space, allowing the tower to be moved more than 100 feet away from the concerned residents. “[Residents] were extremely positive and even grateful that the developer had heard their concerns and that the new developer had responded to them in a very positive way,” Speck said. Jana Cephas, an assistant professor of architecture and urban design at Northeastern University, said she thinks it’s good that community concerns can bring about positive change to the development plans. “When communities do push back because of their concern that things aren’t working in their best interest, they’re looking for another way for the development to happen that will actually bring them that policy for the community that they want,” Cephas said. She added that to solve the issue of congestion in the area, there might be only so much that can be done with the architecture of a building to solve this problem. “I don’t know that there’s much that can be done architecturally that’s going to solve the issue of there literally just being more people in the space because of the introduction of this new building,” she said. Though the plans for the building have not yet been approved, Thomas May, 50, of Brookline, said he can already see the potential benefits of its presence in the square. Brian Gonzalez, 25, of Hyde Park, said he thinks construction in Kenmore Square could make the area more congested. Allyson Abbey, 36, of East Boston, said that it should be the responsibility of developers to deal with managing the congestion of the area and to try to better the location they build on. “The traffic and commuting is already such a problem that I feel like any new buildings that can … keep the conditions either the same or improve them is important,” Abbey said. Sarah Iles and Andy Vo contributed to the reporting of this article.